In the end I decided not to bother going to see Green Lantern this evening. I had no-one to got with today and it would have been tucked away in screen 9. So there would have been a high chance of me being the only one there, which is weird. I'll catch it some other time, probably once it gets to Sky. Also I've go plenty of other things going on this week that my time would be better spent on. Next week I will go to see Transformers 3 though. It turns out that was a good idea after all as today was the start of the Steam summer sale. Spending £15 on a bunch of cheap indie games instead of on a probably mediocre film is a much better time investment. Steam have got another competition going as well, like the previous treasure hunt. So much to do! The mental sort out continues while at the same time I have started working on one of my old stalled projects again. So that's all in progress. Now I'm trying to decide if I should bother going to see Green Lantern tomorrow before it leaves the cinemas and see if the reviews are justified. When planning my upcoming cinema trips I seem to have forgotten about Transformers 3 so I might switch things around. That's usually a Thursday evening thing I guess you'll find out tomorrow what I decided. It's a topic that comes up ever couple of months or so and today is one of those days. I start thinking about the various side projects and ideas I have and start wondering why I'm not doing anything about them. The Vlogbrothers (via ZeFrank) call it Brain Crack, where you become addited to the idea and keep thinking about it rather than acting upon it. You have to let the ideas go for someone else to do or simply get on with them. So that is what I am going to do. 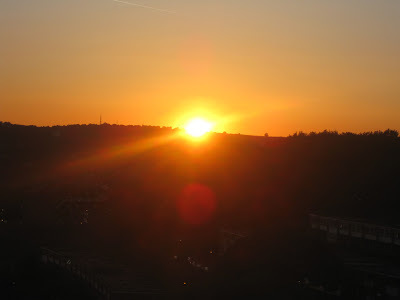 This evening I'm going to have mental sort out and decide what I should work on, what I should just let out to the world and what I should just forget completely. I've actually got a notebook full of all sorts of things, I think it will have to lose some pages otherwise it just becomes too daunting. Still I am pleased that I still manage to find the time for a daily blog post amongst all of this and I hope I can continue to do so. As you many recall if you've been reading this blog for a while, I have recently been reading the Astonishing X-Men comic series. However at the moment I am up to date with the latest published TPB and the next one is not due out until October this year. Now if you remember one of my my few complaints about the story was that although it was labelled as issue one it really wasn't a beginning. 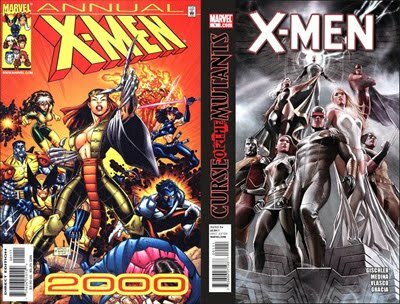 So I started looking into the history of the series and although there have been earlier volumes of X-Men with the 'Astonishing' name, the series I'd been reading was actually an extension of the 'New X-Men' series from 2001. 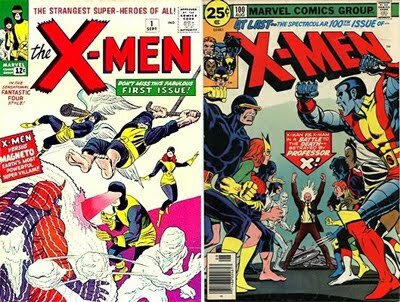 I almost bought the first issues from that series but after a little more research I discovered that 'New X-Men' is actually a continuation of the only series to be titled simply 'X-Men' which started in 1991. So I picked up the first TPB of this series which includes issues 1 to 7. Although this is another issue 1 it's still not really the beginning. 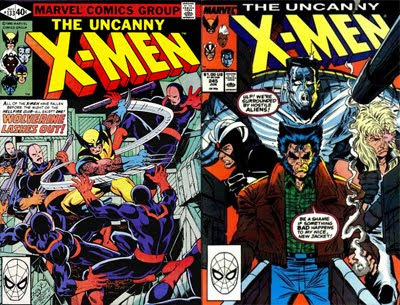 This is a spin-off of the main line 'Uncanny X-Men' and runs in tandem with it. While it is not the start it's probably as good as you're going to get with out going all the way back to 1969. This story is X-Men at its basics with the Xavier and the X-Men verses Magneto and some other mutants while having arguments about mutant rights. There's also a sub plot explaining how the team will split into two to cover the two storylines, on this side (the Blue team) with Beast, Cyclops, Gambit, Jubilee, Psylocke, Rogue, Wolverine and on the other (the Gold team) with Storm, Archangel, Colossus, Iceman and Jean Grey. It does still refer to past events though some which I still know nothing about. There's even a couple of random pages devoted to the Mojoverse which if I hadn't already seen the cartoon very would have been extremely confusing. I presume that's going to be expanded on in later issues. It was a good read though as it contains so many of the core elements of the series, including my favorite Rogue who is sorely missing the the 'Astonishing' series. Although I understand in the 3 currently ongoing storylines she is in 'Legacy' instead. Great to pass the time with while I wait for more of the 'Astonishing' story and of course Buffy Season Nine. It's been a nice day today but I've not done anything about it. I've done some work, I watched the F1 and I've played computer games. I've not been outside at all! :D The work was boring, the F1 was uneventful and the games I'm not allow to talk about. That doesn't leave me with anything to write about this evening. So it's a short post today and hopefully there will be some interesting things going on next week. 1. The fact that there is a Game Program. 2. The fact that you are a member of the Game Program. So for anyone who is interested, I was lucky enough to be chosen for one of the testing groups on Bioware's highly anticipated new MMO Star Wars: The Old Republic and no I can't say anything more than that. I originally signed up over two years ago, getting the email this week was a very nice surprise. Rockstar have finally announced a PC version of LA Noire, to be released later this year. About time to. Still where is Red Dead Redemption? Not that I expect I'll have lot of of time to play it as that will be getting very close to the release of Skyrim by that point. I'm going to have to stop watching Hank Green's "Let's Play" videos of LA Noire now. If I'm planning on actually playing this at some point then that makes them spoilers now. Now it's time for some food followed by some more "secret gaming thing". Busy day of work, followed by the secret gaming thing I mentioned yesterday mean that I have no time left today for a long blog post. If only I was allowed to talk about what I have been doing this evening. I'm sure some people would be very interested. The latest expansion pack for Eve Online has just been released. We now have a feature which has been talked about, suggested and rumored for many years. You can finally get out of your spaceship and walk around. I've been looking forward to this, it certainly enhances the role playing experience. 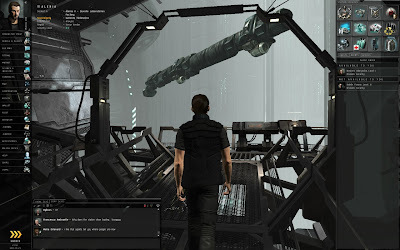 CCP Games are rolling this out in multiple stages to try and make sure nothing goes wrong with such major new features. It started earlier in the year with the updated character creator. Now we get phase 2, the captain's quarters. This is basically just two rooms we can walk around in. A general living area and a balcony overlooking your currently docked ship. It's pretty neat so long as you have the hardware to support it (which I do) but I've seen quite a lot of complaints about performance. This can only get better over time though. For now I shall revel in the fact that for the first time in over two years playing Eve I have legs! It is a little bit underwhelming though. Once you've got over the initial novelty there's not a lot to explore. 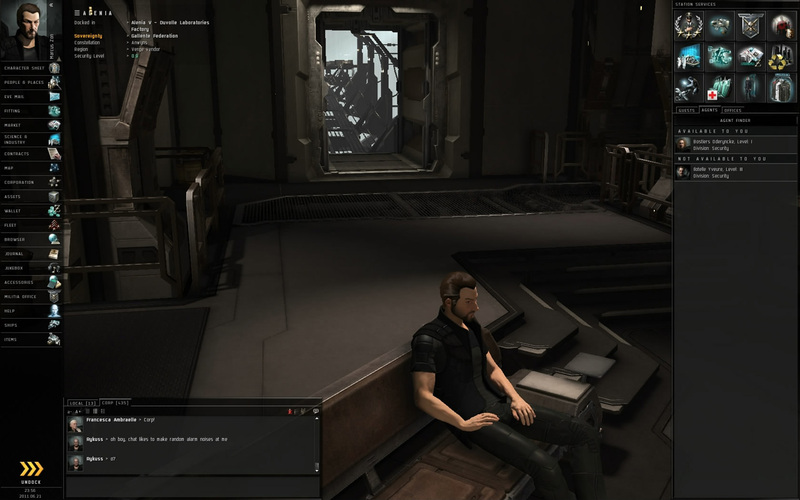 No matter what type of station you dock at the captain's quarters are always precisely the same. 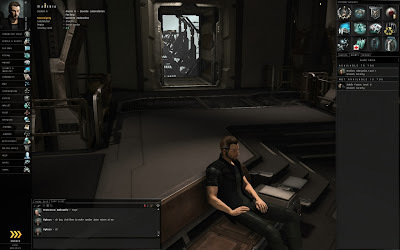 CCP have said that some racial variations will be released to match the station types, but that won't until the next update in August. Still that will get old quickly too. It won't be until we can go to common area and see other pilots that this will become a major new feature. However I don't expect to see that until at least the winter expansion. In other news I got an extremely exciting gaming related email last night. I'd post about it but it's supposed to be confidential. I'm not sure about the exact rules of what I am/am not allow to say at the moment. So for now that's all I will say. Exciting though. I recently picked up another X-Men TPB, this time a much older one. I'll write about it specifically another time after I've read it. However it did start me thinking about the evolution of comic book art. At some point in the last fifteen years the artwork in comics has seen a huge jump in quality and I find myself wondering why that is. Did increasing popularity lead to higher budgets and more respect or did the extra detail in the art bring in the new fans. Or it could have been something else entirely. 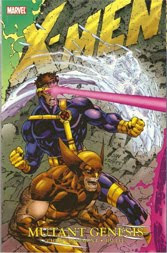 As that's what I'm reading at the moment I'll use X-Men as an example. In the sixties and seventies there's not a lot of detail in the drawings. Many of the actual story pages were simply black & white and the covers were just the same with a little added colour. Other than Action Comics #1 (the first Superman) I've not really read any comics from this era. Unless the stories are particularly good then I'm not sure they'd hold up to today's standards. In the eighties and nineties we've got much more attention to shading and intricate backgrounds but the characters haven't changed much at all. This is the era I've just bought issues from (1991 in fact). It still looks a lot different to the modern examples though. Then from around 2000 onwards the attention to detail has increased to another level and even more work is being put in to the cover art to make them extra special. I suppose it really doesn't affect the underlying story but I'd be lying if I said I preferred the older style artwork. It's possible that means I'm not a 'true' comic fan in the eyes of some people but I've never been someone who cares at all about labels. I like what I like and that's it. It is close and perhaps it is because it's the most recent but Game of Thrones has now taken the top spot from Fringe in the list of TV programmes which I can't wait for the return of next season. Never before have I known a series to so freely kill characters that you would presume are part of the main cast. Now of course that come from the books and I suppose it could be good thing for some of the more famous actors to know in advance that they have a set role to play for a fixed time and are not committed for seven years. However I must remember not to get too attached to anyone if they could disappear at any moment. I've got handle on the names now but it's hard to know who exactly you should be rooting for. It's definitely an interesting twist on the standard Tolkien-esque fantasy world. That is probably why it's such a popular book series. Now I just hope that HBO can find the audience and the finances to keep it going to completion and not end it prematurely if the ratings start to slip. I'm currently visiting my parents today for Fathers Day. When they read this they'll already know and for anyone else that's not really relevant. So instead here's a random picture of some birds in the garden before I go to eat food. For the most part I always try to avoid spoilers. I much prefer to experience something with as little prior knowledge as possible. It makes things that much more powerful when you are not expecting them. I just let the director/author take me for the ride and then do the thinking about it afterwards. This was not always the case. Back in the late nineties when the Internet was still new I ran a Star Trek: Deep Space Nine site and purposely sought out spoilers to post there. My current anti-spoiler stance leaves me with two problems at the moment. Well the same problem twice really. What do you do about books that are also films/TV programmes? It is impossible to experience them both spoiler free. With the first series of Game of Thrones coming to an end I've been wondering about the books. I've enjoyed the TV series a lot and I'm wondering what happens next. The answers are right there to be had, but then I'd know and the TV version would have less of an impact. I think at this point I'll wait. Perhaps one day I'll read the Song of Fire and Ice books, but not for many years, after the TV version is long over. The other problem I have is Harry Potter. Some people will find it hard to believe but I've never read the Harry Potter books nor have I seen any of the films. In all this time I've also managed to stay (mostly) spoiler free. When the books were first released it was before I'd started reading in a big way so I just ignored them really. However at this point it's one of those things which make me feel like a bad nerd for knowing nothing about. Apparently JK Rowling has been extremely resistant to ebook publishing and it's only now that a Kindle version is even being considered. So do I buy print versions? Do I wait for the Kindle version? Do I watch the films while I'm waiting? I suppose if I'm going to read and watch then the books should come first, but I'm still going to visualise Harry Potter as Daniel Radcliffe even though I've never seen the films. Staring at the screen thinking about what I should write here today. However as often happens at least once a week I have absolutely no idea. I hear Green Lantern is getting horrible reviews. I'll probably check it out anyway at some point in the next couple of weeks so I'll reserve judgement until then. There's nothing else to look forward too before Captain America in July followed by Super 8 and Cowboys & Aliens in August. The game with the longest name that I can think of gets a sequel and rather than simply adding a '2' on the end they've added a year to make it even longer. 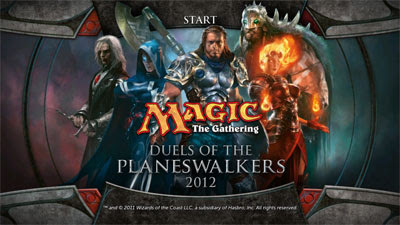 So now we've got "Magic: The Gathering - Duels of the Planeswalkers 2012". Of course the year is related to the current release of cards but it's still a bit of an unwieldy title. I've not played a lot yet and what I have seems very similar to the previous installment. There are new cards and new decks to play with along with updated graphics and a tweaked interface. The weakest part of the first game was the limited deck customisation options, but I've not looked to see if that is any different here yet. There are a couple of things that really show this was developed with the XBox in mind rather than the PC. In particular the main menu which is a pain to navigate with a mouse. Luckily within the gameplay parts it is fine though. I never really found the time to play much multiplayer with humans in the first version but apparently the multiplayer options have been much expanded this time so perhaps I should get in to that some more. Initial impression is good, I'll be back for more. I finally found the time to go and see X-Men: First Class and it was good. It might even be my favourite of all the X-Men films. It's certainly much better than The Last Stand and Origins: Wolverine. We got younger versions of characters we know and the parents of some others. They're all discovering each other, finding out that they're not alone and working on controlling their powers. I've been trying to figure out how the timeline all works out, which is tricky when you've got some characters that have lived for so long. When does the US government discover mutants? Here in the sixties it seems that the CIA either doesn't know or doesn't believe in their existence. Now obviously the Nazis discovered Magneto in the early forties and probably had others as well. Did they know about Sebastian Shaw at that point? Then there's Wolverine who has been around since the 1800s but he remains unknown until he's drafted in to a military mutant squad after surviving a firing squad in the Vietnam War. If I have my dates right that's after this, but not too long afterwards. It's all very complicated. Was that Chris Evans as a young Steve Rogers I saw? I guess not now I think about it, Captain America starts during World War II so the timing is all wrong. Also the X-Men films are run by a different studio to all The Avengers related stuff, but it did look like him. Of course not everything quite fits with the other films anyway. In this prequel/reboot they've chosen to concentrate on story rather than continuity, looking on IMDB I see there are more inconsistencies than I spotted but that's not really important. This is a story of Charles and Erik, their relationship and their motivations. I was never really thinking about the continuity during the film, only afterwards. The acting is great as are all the other things, direction, effects, sound etc. Highly recommended be me even if you haven't seen any of the other films. Big in gaming news over the last couple of weeks has been LulzSec. They're a hacker group the have been up to much mischief recently. I guess they've probably been around for a while under various names but have become more widely known after some high profile hits. The even made the BBC news website after revealing holes in the NHS security system. For the most part, at the last week anyway, they've been hitting gaming related sites. Sometimes they've taken customer data and other times they've just blocked the site with a DDoS attack. They've hit Sony, Nintendo, Epic, Bethesda, Codemasters, PlayStation Universe, Minecraft & League of Legends. They say they're just doing it "for the lulz" and I have to admit some of the comments they've made on Twitter about the incidents have been quite amuzing. For the most part they have not affected anything I'm a major part of, I just had to change my forum password on Epic and Bethesda's forums. Today though they did hit one which affected me more. They launched a DDoS attack on the Eve Online login server and CCP Games responded by taking everything offline until things blow over. It's a dramatic response but it does ensure no damage occurs. It does mean though that no=one gets to play Eve tonight. I wonder how long it will take before they get bored and move on. I suspect a lot of people in the industry (me included) are having a look in to their current security procedures! So I guess it might be a good thing in the end. Interrupted by a phone call just as I was thinking about what to post about today and that distraction led me to run out of time. I need to get back in to the habit of posting earlier in the day rather than leaving it until 11:30! 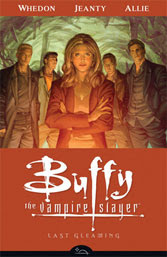 Finally we get to the end of the Buffy Season Eight comics with the final issues in this TPB. These issues started off quite slowly with a lot of exposition as opposed to any action. It's true that there were a lot of plot threads to deal with but I found myself a little lost at times. That's possibly because there is such a gap between each paperback release that many of the minor details get forgotten. I shall have to read through again from the beginning at some point and see if that makes a difference. Still it was an interesting conclusion even if it wasn't as action packed as some of the earlier issues. We had one unexpected character death which seemed to go by very quickly and not be dealt with much. However that will definitely change things in the Buffy universe, although of course the other events of the finale will have much bigger repercussions over a much longer period of time. We know this because we've already seem glimpses in to the future. The setting for Season Nine (which has been commissioned already) seem like it will be closer to the standard Buffy format rather than some of the more extreme things that have happened in Season Eight, but it seems like Joss has an interesting plan. The first single issue of that is due in September I believe, so it will probably be Spring next year before the first paperback is out. Too long! At this point I've played the game for just over an hour. The first thing I'll say is it's not the most super awesome game ever. However after all its troubles I don't think it ever could have been. Maybe if they'd got it out back in 1999 before the first engine change things would have been different. It seems that Gearbox haven't made many improvements after taking over from 3D Realms but simply worked on finishing things off instead. The result is it's already looking a little bit old with graphics you might expect from a 2009 game, especially in the character models. Perhaps it's partly the nostalgia but for me though it's actually quite fun and that's the most important thing. It's a breath of fresh air in the shooter genre which seems to be full of endless serious war shooters at the moment. Sure it's crude and silly but what's wrong with that? I'm looking forward to playing through to the end and the last time I felt like that about a pure FPS game was with Doom 3, which was seven years ago now! And so E3 comes to an end for another year. More Live cam watching today of course but not a lot more to learn about. I did briefly notice that Trine 2 is on the way which is cool. Although I should finish playing Trine first. Also I heard that Torchlight 2 was at the show and playable which is good news. Hopefully that means it will be coming soon. Overall there wasn't a whole lot of stunning announcements this year. Most of the games shown I already knew about, particularly the ones I actually intend to buy. The most impressive looking game, that I didn't already know was coming, would be the new Tomb Raider. People also like to say whose press briefing was the best. My vote this year goes to EA. 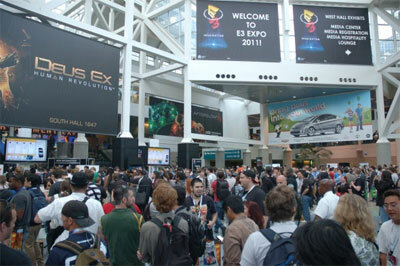 Sony were probably better in terms of showmanship, but EA simply had a better line up of games to show. Day two of E3 and there's nothing much new to report. Most of the major announcements have been made by this point. We do still have the Live Cam guy and get quite a few interesting tidbits from the interviews he manages to get. Today though the big things for me were the stage demos of two of the games I'm most looking forward to; Mass Effect 3 & Elder Scrolls 5: Skyrim. Both of these games are looking great. There are some nice looking features added to Mass Effect 3 such as melee combat and weapon customization. Also some new enemies, I saw what looked like Batarian Husks! Skyrin also seems to have a lot of improvements over TES4, the brand new graphics engine looks good as do the dragons. At this point though I think knowing much more about these games will be spoilers. It's not like they need to convince me to buy the games. I'm a fan of both franchises and was already planning to get both. I'm just impatiently waiting! At least both games have a set release date now. The first real day of E3 begins early with the Nintendo press briefing. They started with a whole bunch of Zelda related stuff for the 25th anniversary. All sorts of new games and re-releases on other platforms. They had a few new games for the 3DS to announce but the majority of the their time was spent talking about their brand new console the Wii-U. It's another pretty silly name but we've come to expect that from Nintendo. 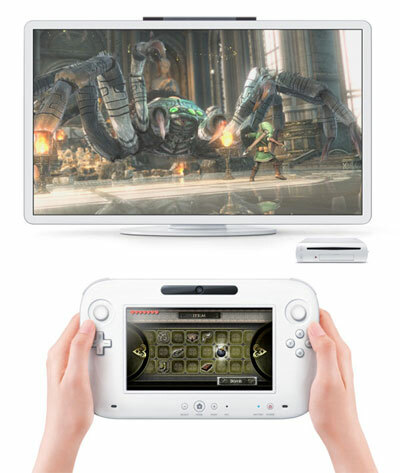 The console itself is nothing special and look very similar to the original Wii, no specifications have been released but it will have more powerful processor and graphics capabilities. What they have got like last time is another new innovation in controllers. The new controller has got a touchscreen on it among other things. My first impression was that it looks a little large but apparently it's quite light. It's a bit tricky to describe so I'll include a picture below. After the Nintendo briefing is over the floor show opens and we get to virtually via Gamespot's Live Cam tour. This is the second year they've done this and it's really cool. One guy carries a camera around everywhere which is streamed on the web, he is a proxy for us and asks/answers questions via email. It's the day before the main floor show begins but this when we find out the majority of the new information as the major companies hold press conferences. Today there is Microsoft, EA, Ubisoft and Sony. The tomorrow morning before the main floor opens is Nintendo. Microsoft got everything started with Call of Duty: Modern Warfare 3. I'm not really a Call of Duty fan, it's just not my type of game, but the graphics do look nice. Then there was the new Tomb Raider. I seen plenty of footage over the years but I've never actually played any of the Tomb Raider games. This new version is a reboot (it's happening in games now too!) re-telling the origin of Lara Croft. It looks interesting I might actually give this franchise a go this time around. New Mass Effect 3 footage looks excellent but there's not a lot of it. Voice commands in the XBox/Kinect version I'm not so sure about, but I'll be playing the PC version anyway. The rest of the Microsoft briefing was downhill from here. Like last years it's all too focused on the Kinect and XBox 360 exclusives. Ghost Recon will Kinect looked silly, Star Wars Kinect looked cheap and unresponsive, "Lightsaber ON!" LOL. The addition of You Tube to the XBox Live dashboard is probably a good thing though. On the other hand I have no need for a Halo 1 remake thanks. EA were up next and was probably the most important to me. While EA do publish for all platforms they 're probably the biggest publisher in the PC sector. They opened with a Mass Effect 3 demo. It was longer than what was shown at Microsoft and is looking superb. At this point though I don't think I want to see much more. 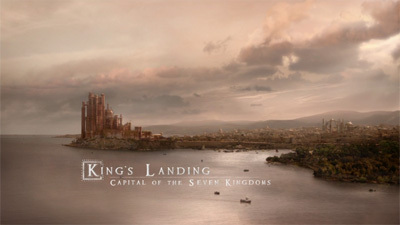 I'd rather experience it for the first time when I'm playing it and we now know that will be March 2012. EA/Bioware are also behind Star Wars: The Old Republic, another game I'm looking forward too. There's still not a lot of information about this and they're still being very vague about a release date. What has been shown though, is looking promising. Of course EA Sports had a large section but I have no interest in that. I'm not all that bothered about Need for Speed either. I do like the look of Kingdoms of Amalur: Reckoning though but with big names like R.A. Salvatore, Todd McFarlane & Ken Rolston behind it can it live up to the hype? I'll certainly be keeping an eye on it. EA ended with a look at Battlefield 3. It's another war shooter which I'm not really interested in, but their new Frostbyte 2 graphics engine looks awesome. I didn't expect much from Ubisoft and that turned out to be a correct assumption. Farcry 3 looked okay, as did Assassins Creed: Revelations. However other than that it was pretty uninspiring. There is less crossover between the PS3 and the PC compared to XBox so I was less interested in what Sony had to offer in terms of games. Uncharted 3 looks ok but I've not played the others. The big Sony announcements where hardware related with their new 3DTV which has interesting split screen capabilities and of course the new handheld PlayStation Vita. However as a PC gamer and DSi owner, although they looked like interesting technology, I probably won't be buying them. Clients, Websites, Software Issues, E3. Many things have conspired against me getting Moments of Gaming completed this month, but now it is here. In the end it turned out to be a bit of an experimental episode. I only had footage from a handful of games, most of which were featured last month. There was some Portal 2, Trine & Audiosurf. However I'd say around 90% of the footage was from Mass Effect 2. For that reason I decided to do something slightly different and dedicate a whole video to a single game. Until now the minimum I'd used in a video was two. I've been thinking about other possible forms for Moments of Gaming, such as doing one game over a longer period of time. So this counts as a bit of a test I guess. It seems to work ok, even though the story is all out of order as the scenes are picked to match the music not to form a narrative. Finishing work off ready for Monday morning. Doing a little video editing. Trying to find time to finish my Portal tutorial which got stalled. I'm low on time for anything else. It's E3 week this week which will hopefully have some interesting announcements. I shouldn't be lacking in topics this week! So that's Monday to Thursady and then Duke Nukem Forever is out on Friday. 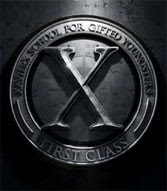 I'm now trying to figure out where I can fit in a trip to see X-Men: First Class. I suppose it will still be on next week but I've got to be careful to avoid Internet spoilers which gets harder the longer it's been out. I don't normally write about every episode of a TV series, if I did there wouldn't be time for anything else. However I guess there is never much else interesting happening on Saturdays so I end up talking about Doctor Who. It's the mid-season finale today though so that counts as a special episode anyway. I would advise against reading any further if you've not seen "A Good Man Goes to War" yet, I've not decided what I'm about to say but I probably end up with at least minor spoilers. So we finally get an answer as too who River Song is. On Friday Steven Moffat tweeted "For all of you who keep on, yes, you will find out who River is tomorrow. Thing is though - was that what you were REALLY asking?" And that's the thing, it's an answer to one question and it probably wasn't the most important question either. We still know nothing about the Silence, who is eye patch lady and what is she up to or how is the little regenerating girl related? Still it was a pretty good episode though. A few small issues with pacing I thought but that's often a problem with multi-part stories and they're building to a conclusion we won't see until the Autumn. I did enjoy a lot the calling in of favours at the beginning. Even though they got very little screen time overall, I found myself really liking Madame Vastra and Jenny. 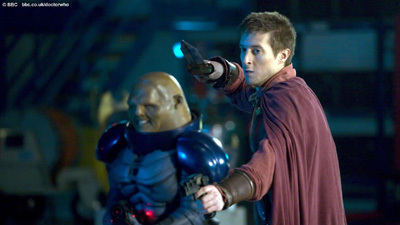 When the Doctor said "Until next time" to them I thought they might make good companions if the Ponds have to go. Though I suspect a full time Silurian would be hard to make work, especially in a present day Earth setting. Now we have wait until October! I suppose spreading it out is sort of a good idea as it means there is only a five month wait rather than the usual nine, but right now I want to know what happens next. 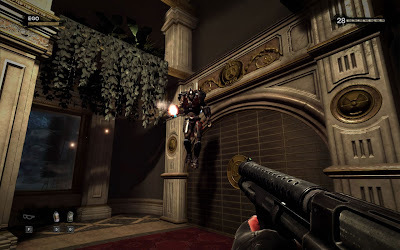 It's been a busy work day so I don't have a lot to talk about, but there is a new trailer for Duke Nukem Forever. Just one more week to go. Why do so many clients come back with a bunch of extra changes with only a couple of days to go before a deadline? There is not going to be the usual spare time over the next couple of days, especially if I go to see X-Men: First Class one evening. That means Moments of Gaming will probably have to wait until the weekend. At least it won't feel rushed like it would if I tried to fit it in tonight. Still it's a bit frustrating, but it's not the first time and I'm sure it won't be the last. To ease the frustration I've been trying to learn the piano version of Still Alive, but that's surprisingly tricky for what sounds like such a simple song. Challenge is good though. That's all for now, I'll keep this short so there's still some time for finish things off and watch of bit of TV.